This all-in-one triple stream formula fights 7 signs of aging with a vitamin-rich complex that combines a daily anti-aging moisturizer, SPF 15 sunscreen and sheer tint for younger-looking skin. Olay Total Effects Tone Correcting Moisturizer offers you an advanced CC Cream formulated to fight seven signs of aging – like uneven tone, age spots, and wrinkles – while providing instant coverage for flawlessly beautiful skin. CC for yourself. Just apply Total Effects Tone Correcting Moisturizer liberally and blend evenly with your fingertips for instant coverage that reduces the appearance of fine lines, wrinkles and discoloration. This hardworking CC Cream also provides nourishing moisturization and includes a broad-spectrum SPF 15 sunscreen to protect your skin from exposure to the sun's harmful rays. Use Olay CC Cream alone or layered under your favorite foundation for even better coverage. Is Olay Total Effects CC Cream superior to BB Creams? 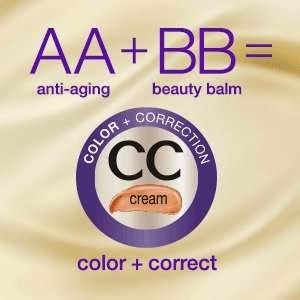 Olay CC Creams work harder than BB Creams because they do more than just provide instant coverage and SPF protection. Olay CC Creams also offer longer-term correction benefits, helping to fight the seven signs of aging over time. What level of coverage does Total Effects CC Cream deliver? Total Effects CC Cream is in between a tinted moisturizer and foundation. It provides more sheer coverage than foundation, so it can be used to replace or in addition to foundation.